On Washington Street in Jamaica Plain, Massachusetts sits a warehouse. From the outside it’s non-assuming. The brick façade gives little clues to what lies inside. However, inside those walls, something amazing is taking place. A chop saw is whirring busily in the corner as sawdust coats the cement floor. Hands are getting dirty as beautiful, handcrafted cutting boards are being made from maple and cherry. But the story isn’t about the cutting boards. Though gorgeous in every sense, the story actually begins with the hands that are crafting each and every piece that fill the product shelves in that warehouse. 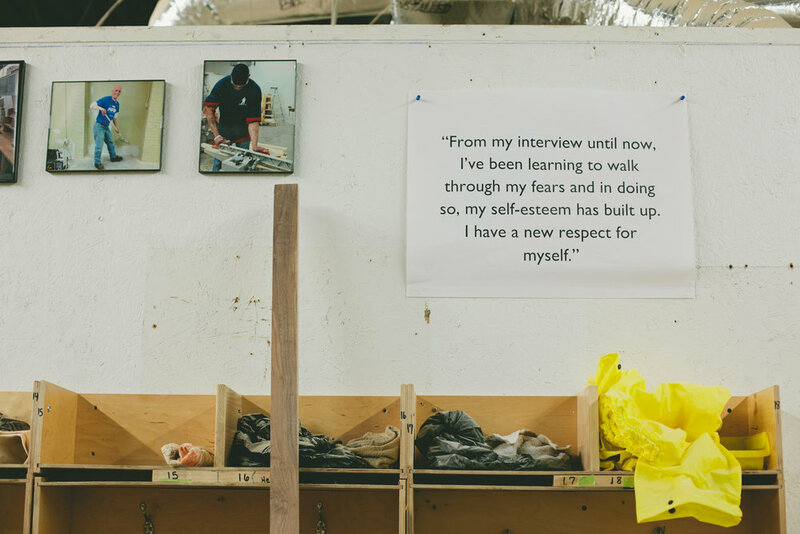 Each board is handcrafted by workers who have experienced homelessness; who’s home at one point or another was not under a secure roof, because that was a luxury they just did not have. Boston HandyWorks is a social enterprise of Pine Street Inn. They are a nonprofit organization whose mission it is to end homelessness through on-the-job training programs and a transitional work opportunity designed to get individuals off the streets and back into the workforce where a world of opportunity awaits. 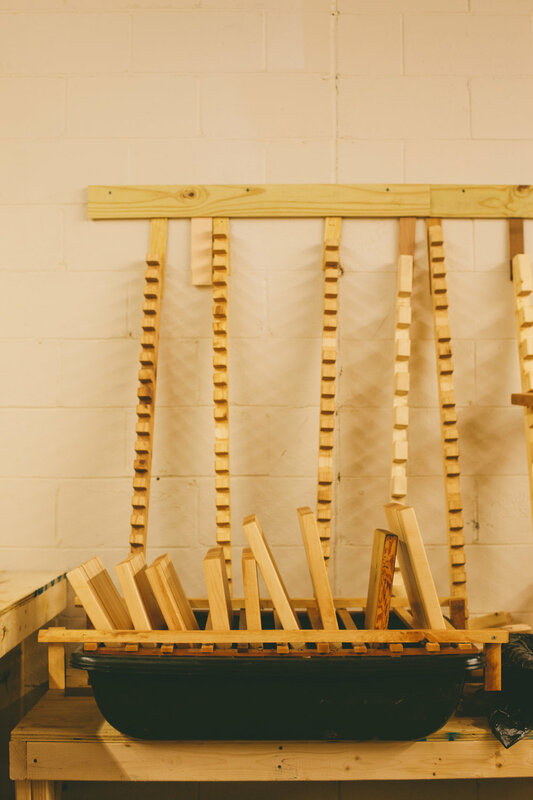 Back in October, we had the opportunity to visit Boston HandyWorks and sit down with the Director, Nick Pieri for a workshop tour and Q&A session. As we entered the warehouse and made our way to the woodshop in the back, the stacks of raw and finished material and the liveliness immediately wowed us as tools buzzed over fresh maple and people moved about. We had been exchanging emails with Nick for a over a month at this point, and were incredibly excited to finally meet the person who helps make this operation run. Founded in 2009, Boston HandyWorks actually began as a services business mainly focusing on flooring and floor care. Nick had been working at Pine Street Inn at the time and was hired to oversee this new employee training initiative. Their goal quickly developed into finding better work experiences for homeless people and to help them improve their job skills, rebuild self-esteem, give them new skills and opportunities to put on their resume, and ultimately, give them the chance to get back into the workforce. By the end of 2009, Boston HandyWorks began seeking out more project-based learning opportunities as opposed to the classroom-based learning that they initially began with. This coincided with a need to come up with revenue. In order to keep offering these valuable training programs, they needed to become profitable, thus the birth of the Boston HandyWorks social enterprise. They started making products in late 2011. Their first batch of handmade goods was birdhouse centerpieces for Pine Street Inn’s annual fundraiser. The following year, for the same event, they crafted garden box centerpieces filled with herbs that was inspired by the chef’s recipes. The next year they introduced cutting boards to the fundraising tables. The feedback was overwhelmingly positive and selling of the boards soon followed. With every cutting board that is sold, 100% of the proceeds go towards funding the Boston HandyWorks training program, providing education, training and resources to help rebuild lives. An average of 35 employees are working at Boston HandyWorks at any given time. Their typical length of employment is about 6 months or less. Although it may seem that the workshop is an ideal long-term job opportunity for many, their mission is to get them out and help them find other work. The employees come from Pine Street Inn, from Pine Street’s group housing sites, from other shelters in the area, as well as from sober houses, pre-release centers, and halfway houses. Every 8 weeks Boston HandyWorks has a new intake of employees and orientation. In addition to learning the hand skills, they are also offered training on everything from sexual harassment in the workplace, diversity in the workplace, to professionalism and goal setting. Before taking the tour of the workshop, we asked Nick about the personal reward he has gotten out of working for such an initiative as Boston HandyWorks. “I completely love it, and I think the other people who work here (do too)…I think it’s safe to say we’re all hooked. It’s really cool just seeing people’s posture change, the way that they carry themselves after a week of meaningful employment. That’s why I keep doing it." Boston HandyWorks, located in the non-assuming warehouse in Jamaica Plain is working miracles just beyond that brick facade. Hard work and beautiful craftsmanship goes into each board that’s produced. And with each board that is sold, the consumer is returning the favor and giving hope to the craftsmen and women. Along with their logo, the Boston HandyWorks motto is also burned into each board…rebuilding lives…a powerful reminder of the men and women who have been given a second chance because of our purchases.